Welcome to the Home Leisure Direct TV Channel, dedicated to Pool Tables. We have a great choice of videos dedicated to the most popular cue sport for home players in the UK. We have videos to show you how to install a pool table, how to measure your room to ensure you choose the right size and have sufficent space. There are also films of factory tours and pool table product videos. If you are a keen league player, or simply love playing the game with a few friends, you are bound to find something of interest. Here you can see our expert installation team installing a Supreme Winner pool table. Whether you are planning to complete the job yourself, or are simply interested in how it all goes together, this video gives all the detail you need. Watch the production process, from seeing where the wood is stored, through machining, construction, levelling, and then finishing. See how the cloth is expertly fitted to the cushion rails. Filmed in the Chevillotte showroom in the centre of Paris, this video takes a look at two tables situated on the first floor - the Chevillotte Concorde and "Le 150". Two fantastic pool tables, displayed in a beautiful setting. The Chevillotte pool table "Le 150" has been designed by Eric Raffy to commemorate the 150th anniversary for the Chevillotte company. A striking and luxurious design, this video allows you to appreciate the details of the design. The (very)table employs a cutting edge contemporary design, constructed from high quality materials. Thsi video shows it's incredible flexibility, allowing you to use it as a dining table or pool table, adjusting the height accordingly. The Chevillotte Concorde is one of our favourite tables. It is beautifully made, employing a simple yet elegant design. It's build quality and playing characteristics are truly exceptional. A choice for the discerning customer. 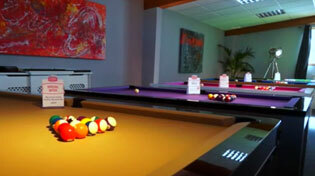 We have a great choice of videos dedciated to the most popular cue sport for home players in the UK. We have videos to show you how to install a pool table, how to measure your room to ensure you choose the right size and have sufficent space. There are also films of factory tours and pool table product videos.